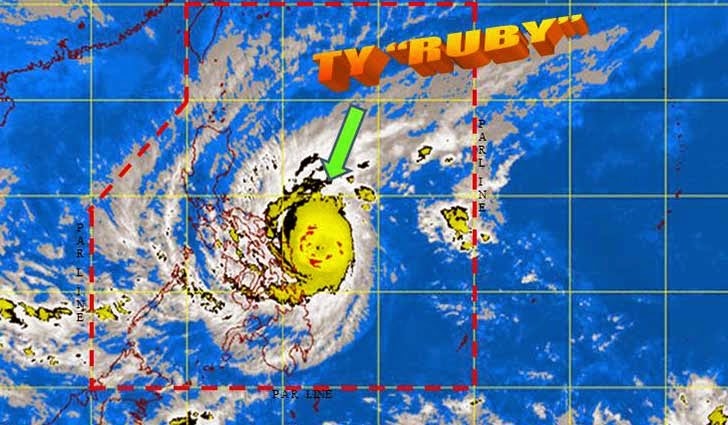 News updates on Super Typhoon Ruby (Hagupit) and storm warning signals from state weather bureau PAGASA as of Saturday, December 6, 2014 can be viewed here. In its 11 a.m. bulletin, the weather agency said the typhoon has slightly weakened as it continues to threaten the Samar provinces while maintaining its course. Expected landfall: Sunday early morning over the Eastern Samar – Northern Samar area and it will be associated with strong winds, storm surge (up to 4.5 meters) and heavy-intense rainfall. Expected Exit PAR: Wednesday evening. At 10 a.m. today, the eye of Typhoon Ruby was spotted 180 kilometers East Northeast of Borongan, Eastern Samar or at 260 km East of Catarman, Northern Samar with maximum sustained winds of 185 kilometers per hour near the center and gustiness of up to 220 kph. It is forecast to move West at 13 kph.